Two iconic structures planned for Brighton seafront will go ahead despite setbacks, developers have said. The i360 viewing tower, due to be built near the remains of the West Pier, still needs a sponsor. Meanwhile, developers hoping to build the Brighton O, a giant Ferris wheel, have withdrawn a planning application that was to be decided on Wednesday. Paramount Attractions said it hoped to build the Brighton O on an alternative site before the end of the year. David Marks, of Marks Barfield Associates, who designed the i360, said the steel for the tower had already been rolled, but the project was still short of cash, and needed a sponsor. He said: "We have got most of the money in place. We have made the significant investment in the project and this year, now that we are coming to the end of the recession, we are hoping to finalise the funding and get on with it." 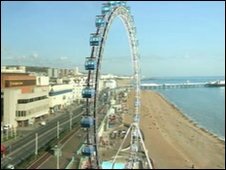 Plans for the Brighton O, a 60m (197ft) observation wheel, were due to be considered by Brighton and Hove City Council on Wednesday. Planning officers had recommended the proposal to be refused. A statement from Paramount Attractions said: "Following three months of exhaustive efforts by Paramount Attractions and Brighton and Hove City Council to resolve concerns raised by its immediate neighbours, including the i360, a solution could not be found. "However, the Brighton O team - which already has £6 million in place to complete the project - is continuing to work in partnership with the council to agree an alternative site on Brighton seafront, with the aim of opening the attraction in 2010." Council leader Mary Mears said: "The planning consultation showed there was a lot of support for the O because of the economic and tourism benefits it would bring. "Some of the objectors also commented that they could support the idea if it was on another site." 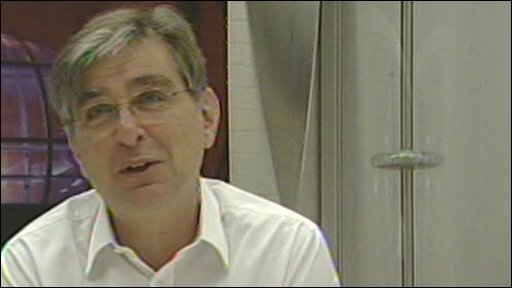 David Marks, of Marks Barfield Associates, who designed the i360, said the steel for the tower had already been rolled.